I confess to having the vaguest knowledge of Shazam the character. The only reason I know the name itself is because of Gomer Pyle. 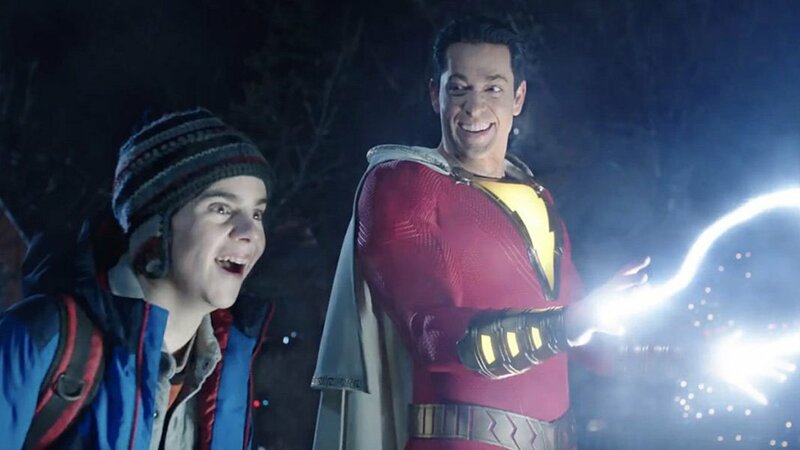 Shazam!, the newest entry in the DC Extended Universe, took the criticism that the films were too serious and somber by going the opposite route and being almost a straight-up comedy. 1974, Upstate New York, Christmas. Thaddeus Sivana is driving up with his father (John Glover) and brother Sid when he's spirited away by a wizard (Djimon Hounsou). Thad might be worthy to carry on the wizard's legacy as a champion, but the wizard finds Thad's heart is not pure, so he sends him back. In his confusion and anger, Thad causes an accident that we eventually find leaves his father wheelchair-bound. 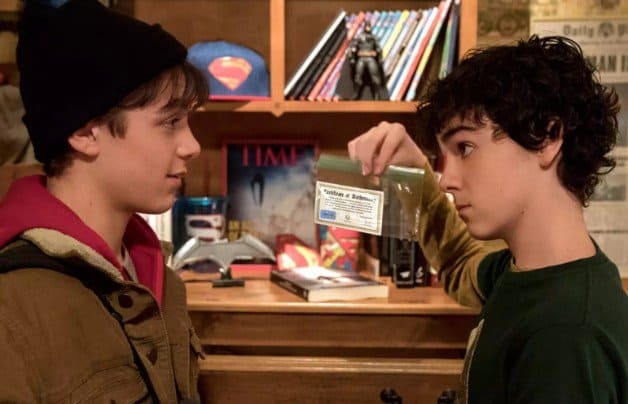 Move up to today, where teen foster kid Billy Batson (Asher Angel) is continuing his search for his birth mother. If it means repeatedly running away from good foster homes and stealing police cars, so be it. He is placed in yet another foster home run by former foster kids Rosa (Marta Milans) & Victor Vasquez (Cooper Andrews). Billy won't bond with the other foster kids: college-bound Mary (Grace Fulton), tech guru Eugene (Ian Chen), quiet Pedro (Jovan Armand) and precocious Darla (Faithe Herman). The closest bond he's made is with Freddy (Jack Dylan Glazer), superhero expert, but it's a tenuous one at that. Dr. Sivana (Mark Strong) has found the wizard and taken greater powers of darkness, it's more imperative that the wizard find his champion to face Sivana. The wizard selects Billy, whom he gives great powers by calling out his name: Shazam. Now as Shazam (Zachary Levi), he is still a kid inside and clueless at the superhero business. With help from his guru Freddy, Shazam stumbles into learning his powers. He also becomes a media sensation and raging egomaniac, causing havoc through his ineptness. Shazam also has to face off against the more experienced Sivana, ultimately learning not only how to be a superhero, but embrace his real family. I ended up rooting for the villain in Shazam! more than the superhero, which is not a good sign. I think it's because if one thinks about how Henry Gayden's script sets things up, Thaddeus Sivana has a genuine case. He's swept up into this otherworldly universe, presented a chance to 'be somebody' versus the loser his father and brother (and I figure his classmates) tell him he is, and just because this kid comes close to falling to temptation this wizard too essentially tells him he is a loser too. To top that off, the trip ends up almost killing everyone and leaving his father disabled. I don't know about you, but if that had happened to me I'd be pretty angry, bitter and resentful too. Shazam! has a tonal imbalance, particularly with its main character. Asher's Billy is morose, haunted, mournful. Levi's Shazam borders on blithering but gleeful idiot. I kept wondering if the transformation from one to the other could cause such a radical change in personality. Up to a point I could accept that Billy would be amazed at being a physical adult but still a young teen. However, Shazam is almost always jolly to where you wonder how he could continue to be constantly clueless. Try as I might, I could not imagine the same Billy who methodically tracked down every potential birth mother could also be so manic and inept as a superhero. Even The Greatest American Hero's Ralph Hinkley was more competent when wearing his superhero suit. I found the younger cast pretty much outdid their older doppelgangers. Asher was excellent as Billy, this lost boy who grows into a more embracing figure. His scenes brought Shazam! 's drama and some light moments too. Grazer too had a great knack for being the Seth Cohen to Asher's Ryan Atwood, the geeky fanboy who serves as Billy's guide to the world of superhero stuff. It's not a surprise then to have a little The O.C. vibe given the original Seth Cohen (Adam Brody) played the adult Freddy when they all speak "Shazam!". Fulton's Mary has some good dramatic moments and Choi is a delight as the technologically adept Eugene. The standout though is Herman's Darla. I rarely say this when it comes to reviews, but she was adorable as the chipper and sweet little sister. When this multicultural family become superheroes themselves, Meagan Goode's adult Darla matched Herman's sweet and enthusiastic version without it being parody. As much as like Levi I quickly grew tired of his "look I'm a kid in an adult's body!" shtick. You can only grin and mug a performance for so long before you want to say, "Enough! We get it!". I figure that he played the part as written correctly, but Levi never convinced me he was Billy. He convinced me Shazam was a near-total idiot. Strong's run on villains continues and I found him limited by the screenplay, but at least he had motivation for his revenge. I was surprised by one aspect in Shazam! that I don't think has been mentioned enough. For a movie targeted at family audiences and even with a PG-13 rating, I was surprised at the scenes of violence and gore. We have one woman disintegrating, Sivana throwing his brother out of a high-rise window, the Seven Deadly Sins almost graphically devouring an anonymous board meeting (we almost saw one of them bite a person's head off) and Shazam himself shot in the head at Freddy's encouragement. All this makes me wary to let young kids, at least younger than 13, see it despite the suggestion that Shazam! is a cuter comic book film. Shazam! is a pastiche of other works: it seems to have nods to among other things Big, The O.C., and The Greatest American Hero. There are pluses with it: the themes of family, the positive portrayal of foster homes, the good use of a multicultural cast without it being overt or heavy-handed. However, Shazam! is very pleased with itself, and that soon starts to grate to where I wanted Sivana to win. Finally, with all the calls to "Say My Name" and no one thought to bring up Destiny's Child?